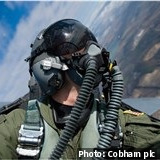 ARLINGTON, Va. Cobham announced that it will be supporting U.S. Navy Naval Air Systems Command (NAVAIR) F-18 and T-45 test flights with its Cobham VigilOX breathing sensors. 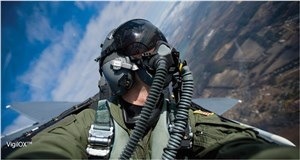 VigilOX, say Cobham officials, is a new kind of pilot-worn sensing system that comprehensively captures real-time physiological, breathing gas, and cockpit environmental data during flight, which will be used to help inform conditions around unexplained pilot physiological episodes. Cobham -- together with with the NAVAIR test team and aerospace physiologists -- are processing and reviewing the data, which will be correlated to reported hypoxia-like symptoms to support root cause corrective action. The team will then formulate a predictive algorithm that will ultimately drive oxygen equipment to automatically adjust oxygen dose as needed to protect the pilot. “Having these developmental sensors flying will show us what happens in the aircraft and physiologically to the pilot under extreme flight conditions should a physiological episode occur. This knowledge will inform us as we design a mitigative response to protect the pilot,” said Rob Schaeffer, Product Director, Environmental Systems at Cobham Mission Systems.